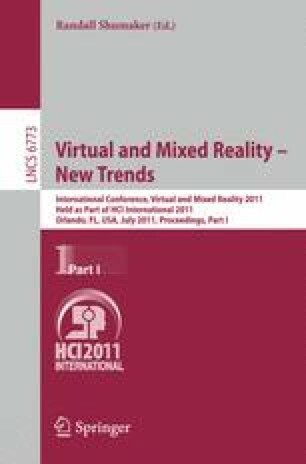 In this study, we propose a portable Brain-Computer Interface (BCI) aiming to realize a novel interaction with VR objects during standing. The ElectroEncephaloGram (EEG) was recorded under two experimental conditions: I) the subject was during sitting at rest and II) during simulated walking conditions in indoor environment. In both conditions, the Steady-State Visual Evoked Potential (SSVEP) was successfully detected by using computer generated visual stimuli. This result suggested that the EEG signals with portable BCI systems would provide a useful interface in performing VR interactions during standing in indoor environment such as immersive virtual space.